How to remove emotion when every second counts. When an emergency situation is happening there isn't much time to think. Emotions are running high from your critical communications team and the members of your organization. A good and successful way to eliminate some of that emotion is to plan ahead and have your messages and actions already completed and ready to send when an emergency happens. Scenarios® allows you to create a sequence of predefined actions for possible situations that can impact your organization. 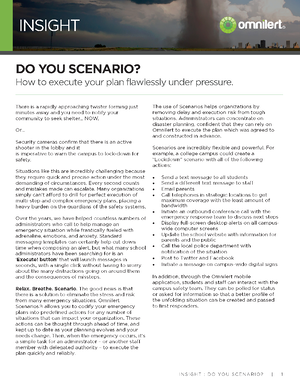 Read this Insight to learn more about what your organization can accomplish with Scenarios®.